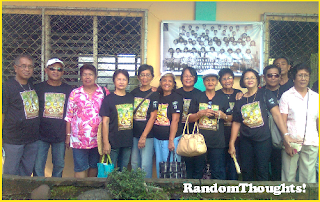 More than thousand of alumni of La Carlota High School/La Carlota City High School/Doña Hortencia Salas Benedicto National High School gathered in their 65th general alumni homecoming this day. This momentous homecoming dwells on its theme: "Lakas at Pagmamahal ng Alumni" (Strength and Love of the Alumni). Sixty-seven members of Class 1970 led by their President Christine Layson-Guerra participated in the morning street parade and stayed in one of the rooms near the gate entrance of Doña Hortencia Salas Benedicto National High School, the recent name of La Carlota City High School. Class 1951 was the earliest alumni participated in and the recent was class 2010 attended the whole day homecoming. A motorcade started off the whole day affair and a short opening program formally commenced the said activity. Reverend Father Vicente Calan of Class 1970, a parish priest of Independent Catholic Church offered a separate prayer for the said gathering among the alumni. He prayed that the Lord will continually shower His blessings to all the students who come after them, give more wisdom to the teachers and school administrators to shape the life of our young to become peaceful and God-fearing citizens of the community and in the world. And Pastor Jalando-on also gave his own prayer. He said, "O Lord, our God, we declare today that you are indeed good, faithful and merciful throughout all generations. Our beloved Alma Mater can testify that you have been with us in the ups and downs of our lives. You are indeed true to your promise that you will never leave us nor forsake us because of this our hearts are full of thanksgiving." He continued, "Today as we gather in this place to be reunited in fellowship with our classmates and friends, we ask for your presence to be with us. We also pray for your blessings to be upon our school. We ask that you will guide the administrators, teacher and staff as they continue to educate your people who will become good citizens o the world that will bring out change and transformation to our corrupt society. "We entrust our reunion to you and our lives to you alone. This is our prayer..."
"Where are you now? Where are you going?" asked Portia Mallorca, officer-in-charge of the Division of La Carlota as she gave her opening remarks to the alumni of La Carlota in their 65th general alumni homecoming. She developed her valuable message on the guise of La Carlota High School Alumni Association and presented it in its respective acronym: LCHSAA. L stands for love, loyalty and legacy. C stand for commitment, competence, and champion. H stands for "hail to thee", humility. S stands for synergy and success. A (first) stands for ambassador. And A (last) stand for action. She finally shared a quantified lessons in life. She said 10% are the lessons acquired from the past. 50% for the present of what they are now. And 40% for the future. 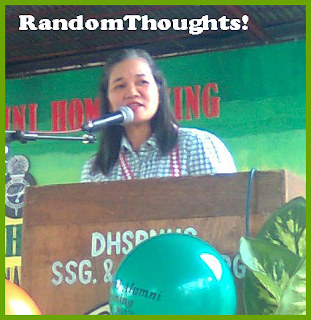 Thus, she said this general homecoming for every 5 years taps a challenge to what do you want to see in your Alma Mater. She closed her message by challenging every alumni to "have the desire of never getting tired of coming back." Engineer Rodolfo Niere of class 1954 share his inspiring message on the importance and relationship of strength and love to one's existence. Another Engineer John Tampo relayed his personal experience on how he became successful in his job in the Echofuel Philippines. Meanwhile, only 67 alumni of our class 1970 attended. Christine Layson-Guerra, class president and Jose Tionsay, vice president managed our group. We stayed in the room at the left of the entrance of the school main gate. This reminds me of my boyfriend's reunion with his classmates. Unfortunately, it wasn't that official that I am not sure if it really pushed through.